Steve Fisher, Science Advisor for the Peel-Harvey Catchment Council (PHCC) told an interested group of U3A members on Tuesday afternoon (24 July 2018) that PHCC is a non-Government, non-profit organisation with its Headquarters at 58 Sutton St in Mandurah, who are the key agents for change towards a healthier Peel-Harvey water catchment. 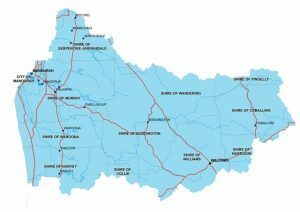 The catchment extends from the Wheatbelt, through forest onto the coastal plain to end up in the complex of Mandurah’s waterways. The Peel-Harvey estuary together with its associated lakes and rivers is recognised as a Wetland of International Significance under the international Ramsar Convention but is located in an international biodiversity hotspot and so is under threat from human driven developments and other activities. 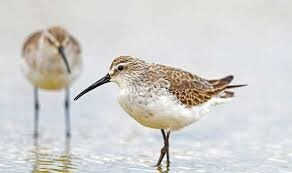 The red-necked stint, he told us, a bird which weighs no more than a chocolate biscuit, together with many other bird species, makes the return journey of over 15,000 km from the Northern hemisphere to the Peel Yalgorup Ramsar wetlands every year to fatten up in order to return North to breed. PHCC is a partner in project Shorebird 2020 which monitors the numbers of these migratory birds. Another local feature of concern to PHCC are the 2000 year old Thrombolites in Lake Clifton under threat from increasing salinity in the lake. Major harm to the catchment is caused by nutrient enrichment of the catchment by nitrates and phosphates and this is being addressed by installation of weirs and revegetation of the many agricultural drains and other inflows into the estuary, for example the Peel Main Drain and the Serpentine River. Another PHCC initiative is the introduction of a local Marine Stewardship Council to ensure that crabs and sea mullet are being harvested from the estuary sustainably so that the present recreational fishing industry can continue to flourish. 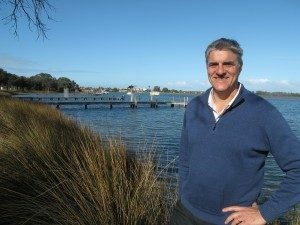 We said good bye to Steve with plenty to think about, not least that Mandurah’s precious waterways are under the watchful eyes of the Peel Harvey Catchment Council.